The Spanish Chapter of the IEEE Intelligent Transportation Systems Society has organized a public event including presentations and ITS awards delivery in the framework of the Distinguished Lecturer Speakers (DLS) program of IEEE. The event took place on November 26th, at the Technical School of the University of Alcalá (Alcalá de Henares, Spain). The opening was done by Miguel Ángel Sotelo, President of the Spanish Chapter of the ITSS, who provided an overview of the ITSS, including highlights about its publications, flagship conferences, student activities, and membership benefits. After the opening, Raúl Rojas, Professor at TU Berlin, delivered a keynote talk as invited Distinguished Speaker of the ITSS. Professor Raúl Rojas has been a full professor of Artificial Intelligence and Robotics at Freie Universität Berlin since 1997. He received his PhD and venia legendi (habilitation) at this university. He studied mathematics and physics, as well as economics, in Mexico City. After the habilitation, he was appointed visiting professor in Vienna and later professor of Artificial Intelligence at Martin-Luther-University Halle (1994-1997). 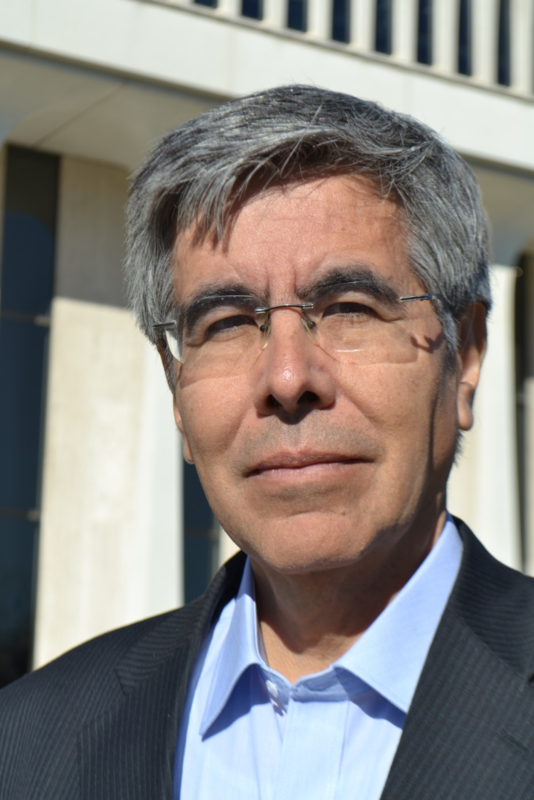 Raul Rojas’ initial research was dedicated to the design and the construction of Prolog computers for Artificial Intelligence at GMD-FIRST. Today, he works on a broad field of pattern recognition topics with special focus on neural networks and developing robots for various applications. With the FU-Fighters he won the world championship at RoboCup 2004 and 2005. From 2006 on, he and his team have been developing autonomous vehicles, which were certified for city traffic in 2011. For his research on computer vision, Raul Rojas received the Technology Transfer Award from the Technologiestiftung Berlin (Foundation for Innovation and Technology). He was appointed as corresponding member of the Mexican Academy of Sciences in 2011, and was “Professor of the Year” in Germany in 2014. 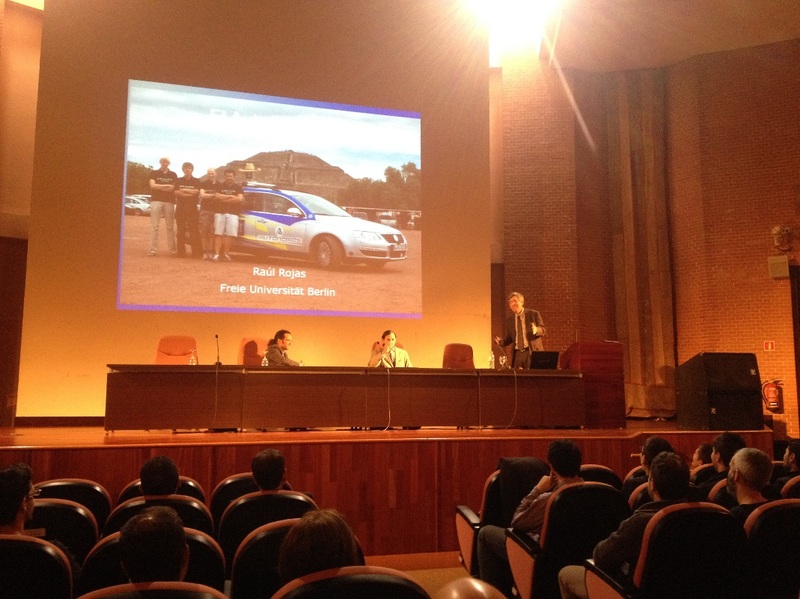 The title of Professor Rojas’ talk was The Car of the Future. In this talk he presented the control architecture of the autonomous car “MadeInGermany”. The vehicle integrates sensor measurements from Lidar, radar, video cameras and a GPS navigation unit. The control architecture consists of a hierarchy of microprocessors feeding preprocessed data to the main computer. This unit computes a long range navigation plan and a short range trajectory. A cost function regulates the decision process. Recently, Prof. Rojas team has also started integrating communication in a fleet of autonomous cars. He showed exhaustive video results illustrating countless experiments (http://www.autonomos.inf.fu-berlin.de/). “MadeInGermany” has been licensed for road and street driving in Germany. It has been shown driving autonomously in Germany, the USA, and Mexico. As an outstanding merit in the field of Intelligent Vehicles, Professor Rojas has recently made the World’s record in Autonomous Navigation after the experiment that has taken his “MadeInGermany” vehicle on an autonomous run of 2.400 Km between Sonora (at the border between the US and Mexico) and Mexico DF, a remarkable milestone that grants Professor Rojas a distinguished place among ITS researchers worldwide. Presentation by Prof. Raúl Rojas. 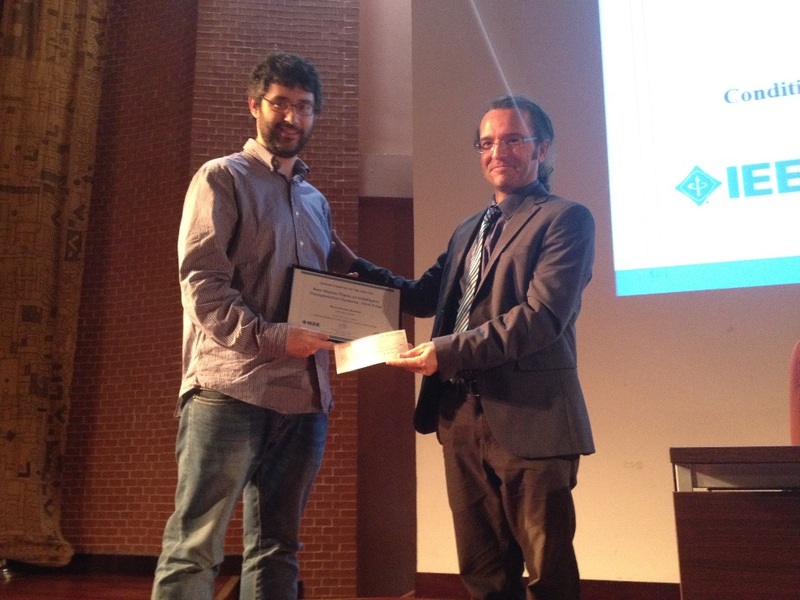 Immediately after the keynote by Prof. Rojas, we started the Spanish Chapter ITSS Awards Ceremony. The Spanish Chapter of the ITSS has organized two different awards in the field of Intelligent Transportation Systems. On the one hand, three awards were given to the Best PhD Theses in the field of ITS developed in Spanish Universities and Research Centers in the past three years. 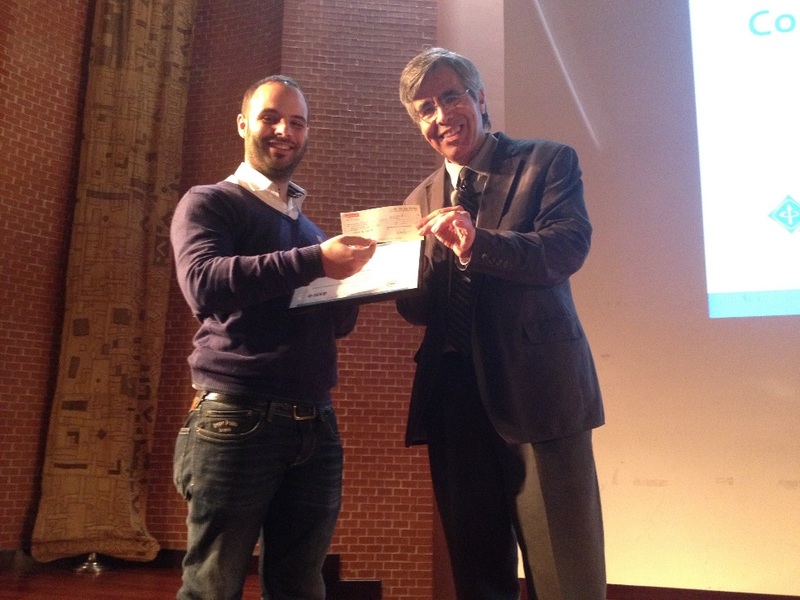 The Best PhD Thesis Award received a certificate and a 600€ check. The second and third awardees received a certificate. Similarly, another three awards were given to the Best Master Theses in ITS developed in Spain also in the past three years. The Best Master Thesis Award received a certificate and a 300€ check, while the second and third awardees received a certificate. All awards were sponsored by the University of Alcalá. Awards to the Best PhD Theses were handed out by Professor Rojas while awards to the Best Master Theses were delivered by Prof. Javier Sánchez-Medina, as Vice-president of the Spanish Chapter of the ITSS. David Vázquez and Mario Passani, as recipients of the First Award in both categories, PhD Thesis and Master Thesis, respectively, delivered a presentation of their respective works. The audience participated actively in the Q/A phase after each presentation, resulting in an interesting exchange of ideas among participants. The DLS event and Awards Ceremony were organized and chaired by Miguel Ángel Sotelo as President of the Spanish Chapter of the ITSS. David Vázquez Bermúdez, CVC. Best PhD Thesis Award. Mario Passani Montero, University of Alcalá. Best Master Thesis Award. After the Awards Ceremony, the audience, awardees, Distinguished Lecturer and organizers enjoyed a dinner together provided by the Spanish Chapter at the Canteen of the Technical School of the University of Alcalá. The event provided the opportunity for a great gathering of members of the ITSS Spanish Chapter. IEEE ITSS is the company responsible for studying technologies and developments needed to improve everything in the field of intelligent transport IEEE. The society advances in theoretical, experimental and operational aspects of Electrical Engineering and Information Technologies applied to transport systems.